Indigenous ingredients inspire a healthier re-invention of baking classics with Canadian flavour. Strip fat and sugar from the Canadian diet, and our nation would be doomed. In a country where the weather can dip deep into the minus double digits for five months of the year, those two ingredients, when combined with carbohydrates, make countless pleasing combinations that helped us survive. For 50 years or more much of our baking has been made with ingredients that, like snow, have been white – flour, sugar, shortening and lard. But bakers are increasingly curious about indigenous ingredients and are giving Canadian sweets a makeover. 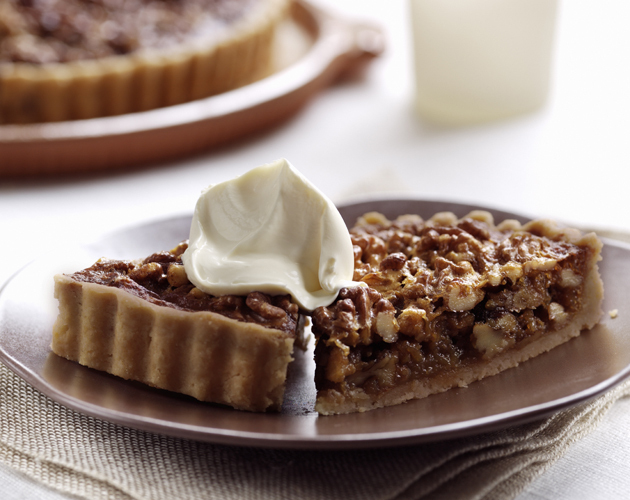 Black walnuts add an earthy flavour to the one-note gooey caramel filling in the much-beloved walnut tart. Pastry, a mostly bland foundation, is being made with flours with robust flavour like buckwheat, rye and the distinctly Canadian wheat, Red Fife. Baking with Canadian ingredients is a delicious way to express our mostly quiet national pride. Best of all, it’s just plain good for us. Whole grain flours that have been stone milled retain their unique flavour and nutritional value. There’s more fibre in the flour; they won’t have a talcum-like texture because the endosperm and hull remain after milling. So gather the black walnuts that fall from the tree in your yard, find a local miller or beekeeper. Discover new ingredients that add a unique Canadian appeal to your baking and celebrate the flavours of this beautiful place we call home. Just enough black walnuts are added to give this traditional nut tart a hint of deep earthy flavour. An elegant dessert served with ice cream or drizzled with melted dark chocolate. Substitute English walnuts if black walnuts are unavailable. Preparing the Red Fife Crust In a bowl, sift together flour, sugar and salt. With pastry blender or knives, cut in butter until mixture resembles coarse sand. Add the egg and bring dough together quickly. Pat into a square and wrap in plastic. Refrigerate for several hours or overnight. Let stand at room temperature for 30 minutes before rolling. Roll the dough to line a 10-inch (25 cm) round tart tin. Press the dough into the tin, using scraps of pastry to patch crust and make edges an even thickness. Prick bottom with a fork. Place tart in a sealed plastic bag and refrigerate for several hours or overnight. Place chilled tart shell on a baking tray. Line with parchment paper to come up the sides and fill with pie weights. Bake in 350 F (180 C) oven for 15 minutes. Remove pie weights and parchment and return shell to oven for another 5 minutes. Let cool slightly. Preparing the Black Walnut Filling In heavy saucepan, combine cream and sugar. Bring to a boil over medium heat. Reduce heat to medium-low and simmer gently for 5 minutes, stirring often (mixture will foam slightly and begin to thicken). Add nuts, rum, zest and salt; cook for 5 minutes longer (mixture will thicken and be golden yellow in colour). Pour into baked tart shell, distributing nuts evenly with a spatula. Bake in 375 F (190 C ) oven for 20 to 25 minutes, rotating tray halfway through baking. Finished tart will have a light caramel colour. It can be baked longer if a darker caramel is preferred. Let cool completely in the tin. The fruit from this tree that is native to eastern North America and found throughout Ontario and parts of Quebec has a musky, slightly bitter flavour. The nuts are easy to harvest when the fruit falls from the tree but it takes plenty of skill, labour and muscle to extract the meat from the shell. Two pounds of black walnuts in the shell yields one cup of nut meat. If processing seems daunting or you’re outside the growing zone, black walnuts can be ordered through Forbes Wild Foods (wildfoods.ca). 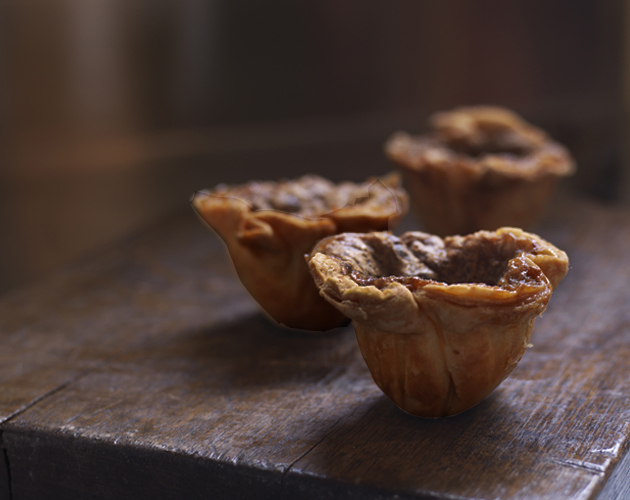 With the grassy flavour of Red Fife wheat and the mineral sweetness of maple and molasses, these “two-bite” butter tarts could become a new Canadian classic. Preparing the Maple-Molasses Filling In bowl, whisk together the egg and maple syrup. Add butter and whisk in sugar, vinegar, molasses, vanilla and salt. Set aside. Preparing the Maple-Molasses Butter Tarts Roll out Red-Fife dough to approximately ⅛ inch thickness (¾ cm). Cut out 3-inch (8 cm) circles and line 24 non-stick mini-muffin cups (trim can be rolled again). Place pastry-lined tins on a baking tray. Whisk filling to ensure the sugar hasn’t settled on the bottom and fill the tarts two-thirds full. Bake in 425 F (220 C) oven for 10 minutes (filling will be bubbly and loose). Let the tarts cool in the tin until the filling solidifies and then remove. Red Fife is a heritage grain that has not been altered in a lab and takes its name from its colour and the farmer first to plant it in Ontario in the early 1800s (David Fife). It adapted easily to the diverse growing conditions in Canada, and many modern wheat varietals derive from it. The flour is a darling of Canadian artisanal bakers because it produces tender baked goods and has a pronounced nutty, grassy flavour. It is available in health food stores or online through Mountain Path (www.mountainpath.com). 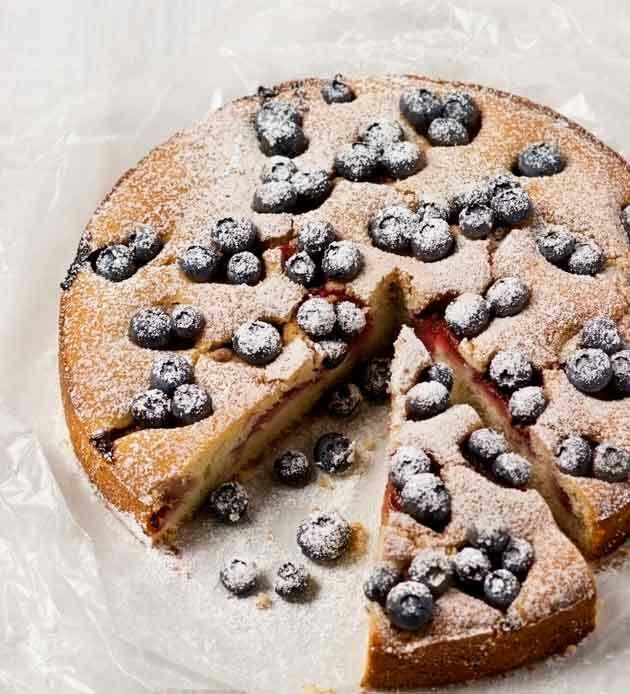 Heaven is a slice of this cake and a good cup of tea. Similar to a traditional French pain d’épices, it is good plain, spread with butter or topped with a honey glaze. Butter 9- x 5-inch (23 x 13 cm) loaf pan and line with a strip of parchment paper. In stainless steel saucepan, bring the honey and coffee to a boil. 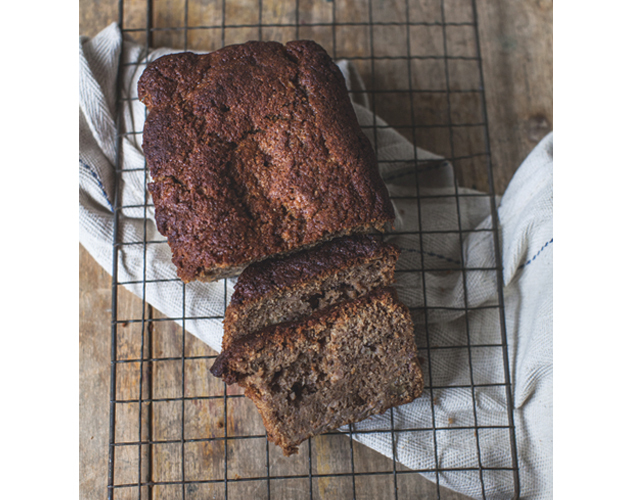 Remove from the heat and whisk in the butter until melted and then ¾ cup of the rye flour. Transfer mixture to a large mixing bowl and let cool slightly. Add eggs to the mixture. In a bowl, sift together 1 cup of the rye flour, baking powder, baking soda, ginger, allspice, anise, nutmeg and clove; add to egg mixture, mixing just to combine. Pour batter into prepared pan. Bake in 350 F (180 C) oven for 30 to 35 minutes or until a toothpick comes out of the centre clean. Let cool in pan. Before eating, store cake in a sealed plastic bag overnight to let the spice flavour develop. Well wrapped, cake will keep five days. Miels d’Anicet Honey The pastoral landscape of the Upper Laurentians is home to miels d’Anicet, the largest producer of organic honey in North America. 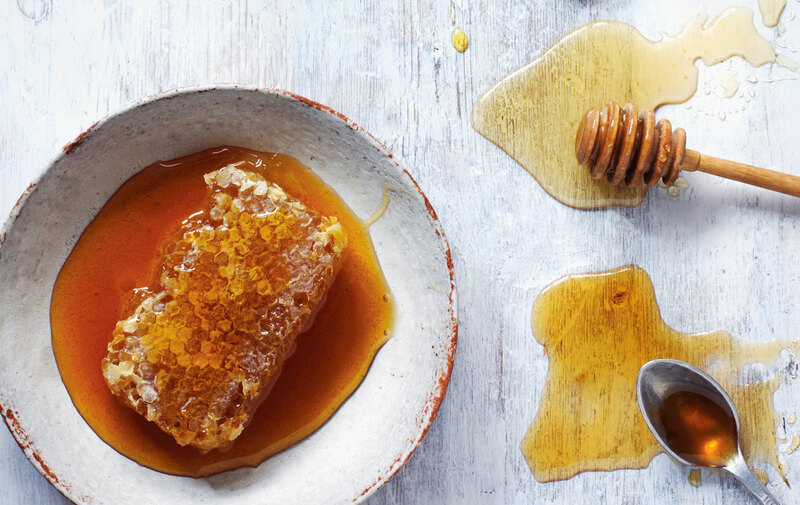 The “best honey in Canada” according to celebrated Quebecois chef Normand Laprise. Anicet Desrochers is known internationally for his bee expertise and is one of the few queen bee breeders in North America. With more than 1,200 hives on the property, the unique flavours in their seasonally inspired honey come from the floral diversity of their land – cherry and dandelion flowers in the spring; linden, clover and chicory in the summer; and milkweed and goldenrod in the autumn. When you put this golden, light-as-a-cloud pudding flecked with wild blueberries on the brunch table you’re sure to be adored. It’s easy to make and is just as good for dessert with crème fraiche or ice cream. Butter a 10- x 1-inch (28 x 3 cm) ceramic quiche dish or pie plate. Heat a large cast-iron frying pan over high heat and add cornmeal. Toast, stirring constantly, until it smells of corn and turns a deep yellow. Do not brown. Remove from the heat. In a large saucepan, whisk together the toasted cornmeal, salt, cream and milk. Bring to a boil over medium-high heat and remove from the heat. Whisk in the maple syrup. To ensure the eggs don’t scramble, temper the eggs by whisking in approximately ¼ cup of the cornmeal mixture. Whisk egg mixture into the cornmeal. Sprinkle baking powder evenly over the surface of the mixture and whisk in. Pour into prepared dish and sprinkle with blueberries. Sprinkle with sugar and dot with the butter. Bake in 400 F (200 C) oven for 30 to 35 minutes (centre of pudding will have a slight jiggle when done). Remove and serve. The pudding is also delicious served at room temperature. Native North Americans enjoyed this simple porridge, pronounced saw-taw-teeg, made by boiling cracked corn and dried wild blueberries in water. Early pioneers made it their own by adding cream, eggs, sugar, and butter. Tender and full of cheese flavour, these shortbread are a natural with an aperitif, glass of port or as a snack with fresh fruit. Stilton or Fourme d’Ambert are suitable substitutes if Glengarry cheese is unavailable. Trim rind from the cheese and discard. Crumble cheese. With an electric mixer on medium speed, cream cheese and butter together until well combined. In a bowl, sift together oats, both flours, sugar and salt. Add dry ingredients to butter mixture and mix on low speed until the dough just comes together. Form dough into a six-inch (15 cm) disk, wrap in plastic wrap and refrigerate for 30 minutes or up to several days. On floured surface, roll chilled dough out to a 9- x 15-inch (23 x 38 cm) rectangle. Cut into 3- x 1-inch (8 x 3 cm) rectangles and place on the parchment-lined baking sheet (shortbread will not spread during baking). Roll and cut any remaining trim. Bake in 350 F (180 C) oven for 15 to 20 minutes, rotating the tray halfway through the baking time. The finished shortbread will be light golden when baked. 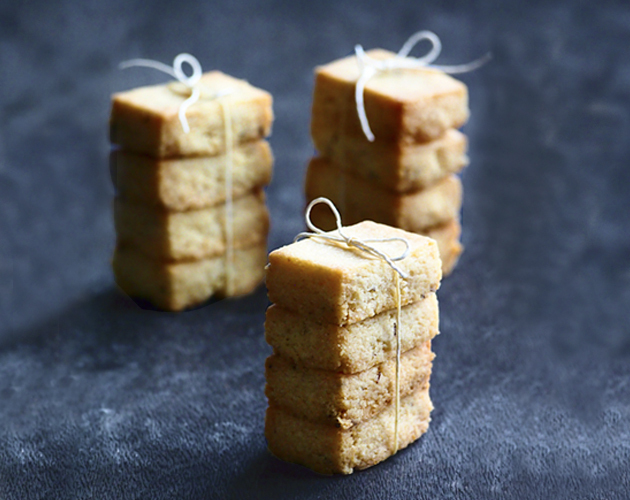 Once cool, the shortbread can be stored in an airtight container for up to a week. The flavour of the cheese becomes more pronounced as shortbread is stored. Mild, buttery and able to woo anyone on the fence about blue cheese. This creamy aged Canadian blue took the 2015 American Cheese Society Awards by surprise when it won Best in Show. The Holstein cattle that produce the milk are just down the road from the cheese-making facilities. Glengarry Fine Cheese is a 35-minute drive from Ottawa, near the village of Lancaster, and their cheese is available from fine food purveyors throughout Ontario. Deborah Reid is a professional chef with a passion for writing and recipes. Dawn Woodward is co-owner, with partner Edmund Rek, of Evelyn’s Crackers and Whole Grain Bakery in Toronto.